Couldn't sleep tonight. This was the result of my insomnia. Anyway, I needed another excuse to paint those lovely cheekbones. 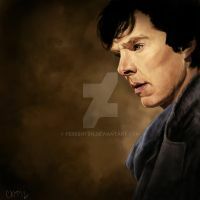 I'm glad to paint a warmer tone picture of Sherlock, as so much of my stuff is cool colors. Given the hints I have heard about the upcoming episode, perhaps this is a Cassandra-like portrait with the heavenly glow. I hope not. This is the equivalent of a speed paint for me. About 3.5 hrs start to finish on cs5. Wonderful emotion and mood about the painting! Gaah! I feel so sad now! 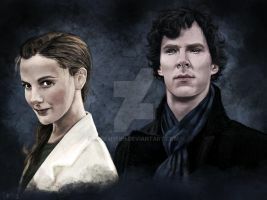 My gosh your artwork is so freaking amazing!!!!!! 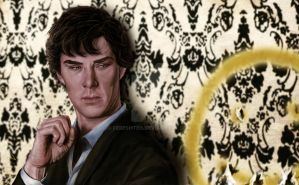 I hope you will consider submitting this incredibly beautiful portrait to thankyoubbcsherlock - On Friday, September 5, 2014, flowers and the blog URL will be sent to the show as a gift of appreciation for all the pleasure "Sherlock" has brought so many of us. Submissions will also, as I understand it, continue to be added to the blog after that. I really like your drawing style and you really caught the expression in this one. Pictures with a good expression are always special for me, because I think that shows character and not just a person, you know what I mean? xD And I think this picture shows a lot of character, because he don't often shows any feelings but when I see this... I suddenly feel with him. I'm glad! Sociopath or not, I think he feels quite deeply, and Mr. Cumberbatch does a good job trying to walk a fine line. damn right, they're lovely cheekbones. All of those accented lines... God he is gorgeous and you've captured it perfectly! This has been featured here: ladyofsilver.deviantart.com/jo… I hope you don’t mind! Please let me know if there’s any objection. Thank you! Of course I don't mind. Thank you very much! I'm honored. Very fine, mature piece of work. Nice to see; you are very good at this! I am about to do molded felt dolls of Sherlock and John, and I am looking forward to the weeks of tireless drudgery! First sculpted positives for the heads and hands, then hot molding the felt in the Polyclay mold, painting the molded felt masks, hair, and then making perfect little clothes. Should keep me busy! Keep making wonderful art, and thanks for sharing! Thank you! I was never good at 3D art, so I'm always impressed when I hear about people like yourself who can manipulate clay and the like so effectively. So wonderful; the tears are so well done it makes me sad. 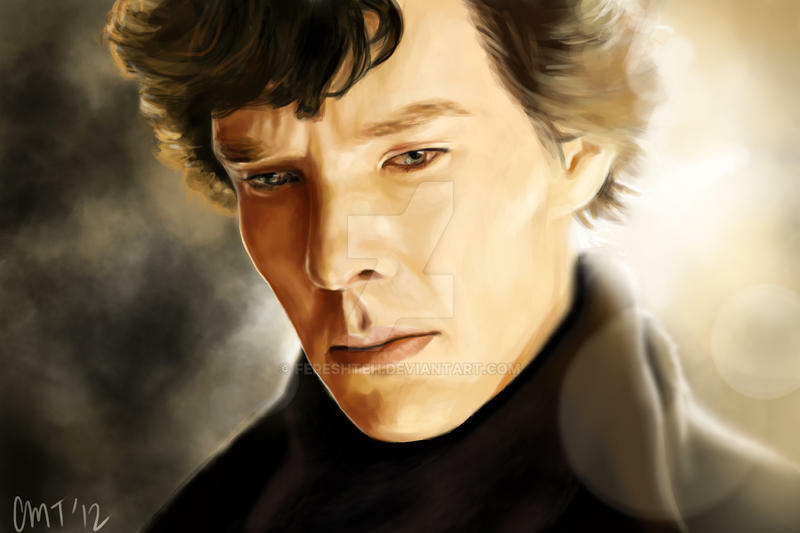 o.o Why is Sherlock looking this sad?? Don´t look so sad... it makes me sad, too! I love this show. He looks almost nice here, and not like the snarky Sherlock of the BBC series at all. I don't know if that makes sense. The expression on his face just breaks my heart. Amazing. 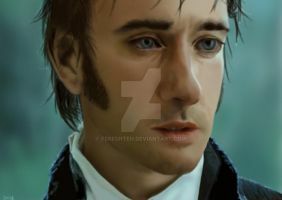 I can belive that you draw this!!!! I thought it was a picture!! This is lovely! The sad expression is just wonderful. It's so rare to see this sort of expression on him. Amazing work! 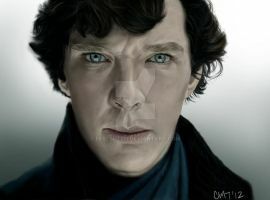 Beautiful you can see the loneliness in his eyes, just beautiful it wants me to make me cry a little I just want to jump to him and say "I'm here if you ever want a shoulder to cry on"
I think he could use a shoulder, poor Sherlock. I wish my sleepless nights would result in such magic as this. The thoughts behind those eyes... beautifully captured yet never so clear that it would reveal too much. Beautiful work on a wonderful character. Thank you. He is a wonderful character indeed. He has no heart. Yeeeah... sure, Sherlock! I saw that in the finale. Especially when he started crying on the phone to John...I was absolutely sobbing.